$342.99Cash price is available if paying by a cash method. This TAMA SLP bubinga snare drum uses 12 layers of bubinga to create an incredible sounding snare. The bubinga gives this drum with a warm and rich response. The thicker shell creates a focused and tighter sound while the flanged hoops allow the drum to breathe. The perfect snare for live or recording situations. The finishing touches are a quilted bubinga outer veneer and the visually striking black nickel hardware. With the S.L.P. 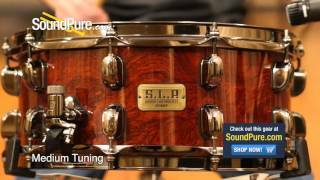 Bubinga snare, you getting almost all of the upgrades of the Starclassic bubinga at a budget friendly price. This TAMA SLP bubinga snare drum uses 12 layers of bubinga to create a snare with a wide frequency response, focus, and incredible punch. It's a very dry sound as well, making this the perfect snare for recording in the studio. And for a classy look, the outer ply is quilted bubinga and is accented with black nickel hardware. While its suggested musical styles include pop, R&B, rock and country, the G-Bubinga is considered to be the best all-around snare in the S.L.P. series. If you like what you hear, check out this snare at SoundPure.com or call us anytime at 919.682.5552. Thanks for watching!